As you may have noticed from the flurry of Career Fair emails, the Spring Career Fair is quickly approaching! With the Career Fair just a few days away, now is the time to dust off your resume, dig out your business formal outfit and brush up on your elevator pitch. As you prepare yourself for the Career Fair, you may have questions about how to prepare most effectively, how to get the most out of your career fair experience, or what to do post-Career Fair. Luckily, we have plenty of advice and information about this! Below are some quick tips for the Career Fair that were put together by the Career Services Team. We also have a “Making the Most of the Career Fair” Guide that answers even more FAQ’s about the Career Fair, as well as provides you with more detailed answers to some of the topics discussed below. So, first check out these quick tips, and then check out the guide! 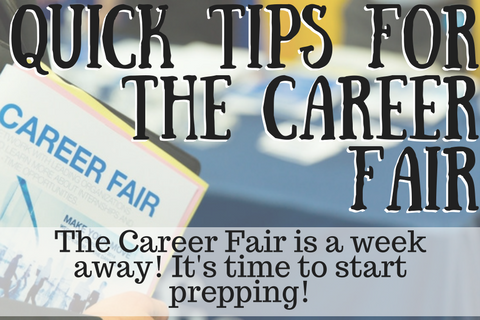 With Career Fairs, the more information you have, the more prepared you will feel! And feeling prepared, means that you will feel confident–which is the key to success in most situations! Click here to access our “Making the Most of the Career Fair” Guide. If you receive an “Unauthorized User” error message in accessing the document, log into BentleyLink and then try again. Get you Career Fair Fast Pass! Here’s a video on how to go about doing that. You can also click here for a blog with additional important information about the fast pass. Research the companies coming and the positions they are seeking to fill. Download the free ‘the Fairs’ app in the app store or the Google play store. This app features complete company listings, an interactive floor plan, and announcements for real time updates, so please get started now to do your research for the career fair. Watch this video for a how-to on how to find the app. Watch this video for an overview of what the app has to offer! Resumes: Be sure your resume is error free! Bring several hard copies of your resume to the career fair to network with different employers! If you attended a Career Fair Fast Pass session you are already registered, so please remember to bring your lanyard with your name tag and you can head right in the day of the fair. If you did not pre-register – no problem – just bring your student ID and register at the Career Fair. This is a Business Attire event – so get your suit ready and Dress for Success! There will be three shuttle buses continuously transporting employers and students between upper campus and the Dana Center. The bus will pick up attendees behind the LaCava Building, Miller and Trees at the designated “Shuttle Pick Up” location and shuttle them back and forth from Dana Center. Please look for signs to direct you. This may help if you are trying to get back to upper campus for a class. If you’d like additional tips about how to have a successful Career Fair, click here for more advice. Plus, be sure to stay tuned for additional content about how to have a successful Career Fair over the course of the next week! We look forward to seeing you next week at the Bentley Spring Career Fair.